Edward (Ted) Tkachuk - Edmonton's Burial & Cremation Professionals | Trinity Funeral Home Ltd.
With great sadness we share with you that Ted has passed away. He will be forever missed by his beloved wife and partner of 35 years, Rosemary Karges. He leaves behind his sons, Simon Fraser (Declan and Tavish) of St Albert, Aaron Fraser (Tasha LaFayette) and their children Aries and Addison of Edmonton. He leaves behind his brother Bill Tkachuk (Kathy) and sister Joanne Tkachuk (Don Schick) all of Edmonton, his uncles Dennis Down and Billy Down (Bea) and numerous cousins all in Saskatchewan of whom he was so very fond. He is predeceased by his parents Bill and Ethel Tkachuk. His career in Film and Television spanned over 35 years first ACCESS Network then Video Pack as well as time freelancing. 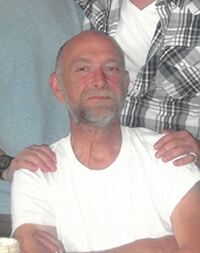 For the past 15 years, he shared great friendship and camaraderie with his fellow workers at Samual and Son in Nisku. He will be remembered for his humor and quick wit, the quiet compassion with which he always supported his family and friends. He enjoyed many years of travel and adventure with his Harley Buddies. In the past few years, Cuba had become his Happy Place. His 4 grandchildren were his greatest joy and delight. A celebration of his life will take place later this summer. In lieu of flowers please donate to the SPCA, or the charity of your choice.